ESA astronaut Tim Peake has provided his backing for a University of Essex proposal to build the world’s deepest and largest pool for space and deep-sea research and training. 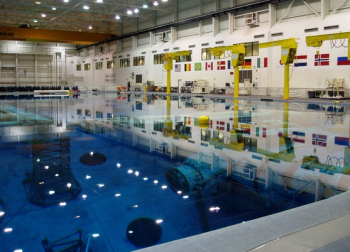 Such a pool would provide the UK with its own “rival” to the Neutral Buoyancy Laboratory (NBL) at the Johnson Space Center (JSC) in Houston. The University of Essex announced it has entered exploratory discussions to establish the world’s deepest and largest research, training and development pool on the Knowledge Gateway research and business park at the Colchester Campus. 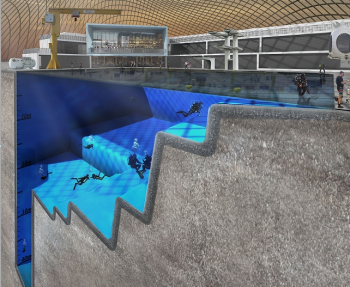 Development partner Blue Abyss says the pool, which will be 50 meters long and 50 meters deep, will be the UK and Europe’s premier marine and space research facility – offering the ability to simulate outer space and deep-sea environments in one location. It would become a UK option to the training pool located at space centers in Russia and – arguably the most famous facility – in Houston. The 202-foot-long, 102-foot-wide pool is at the center of JSC’s NBL – which was designed to support spacewalk planning and training using full-scale mockups of the space shuttle and a large area of the International Space Station (ISS). While the 6.2 million-gallon, 40-foot-deep pool has continued to support NASA’s activities, a transparent 12-foot faux floor was installed into designated areas to support survival training for its commercial activities that is being utilized by Raytheon Technical Services and Petrofac Training Services. 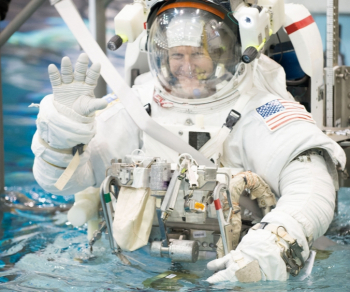 While oil workers enjoy safety drills in the NBL, the facility is still very much focused on training ISS astronauts ahead of their missions to the orbital outpost, especially if they are tasked with spacewalks. One future ISS resident, Tim Peake – who will become the UK’s first “government-sponsored” astronaut when he launched at the end of this year on Soyuz TMA-19M – has trained in the NBL and welcomes the prospect of a similar facility in the UK. “I support Blue Abyss and sees this future facility as something that does not yet exist in Europe and that would compete with, or potentially even surpass, what is available in the United States and Russia. In my view, this will be an outstanding ‘European facility’,” noted the former British Army Air Corps officer. The scope of the facility, which was showcased at the UK Space Conference in Liverpool, is huge from human spaceflight research programs to environmental monitoring. The facility will also specialise in training in advanced commercial diving techniques and free diving alongside research into marine environments, human physiology, remotely operated vehicle and aerospace development. The University and Blue Abyss will be working over the coming year to develop plans to locate the facility at the Colchester Campus. “This is a very exciting proposal for us, with many elements that fit very well with our strengths as a University,” added University of Essex Registrar Bryn Morris. The Blue Abyss project already involves GMW as architects, 3PM as project managers, Pell Frischmann as civil engineers and Gardiner and Theobald as quantity surveyors. Professor Walter Kuehnegger, one of NASA’s Apollo Lunar Exploration Principle Investigators, has also joined the Blue Abyss team as a consultant. While the proposed facility is aimed at conducting similar operations to the NBL in Houston, it’s appearance will differ greatly, with a pool that has various levels, down to a deep end of 50 meters. The location, near to Stansted Airport and the North Sea offshore industry via Harwich, will also aid its commercial attraction. “A human performance Research and Development centre of the nature envisaged by Blue Abyss could become the research laboratory that is sorely needed for human spaceflight and extreme environment applied research in the UK,” noted Dr Simon Evetts from the Wyle Corporation, who has been helping develop the research arm of Blue Abyss.